Cultivating garden is a good way for any gardener to spend their time in a beneficial activity. Before planting gardener must know what kind of things needed to be grown. We can grow many colorful flowers that are full of nice fragrance to make the surrounding pleasant, herbs to use as one of the ingredient for eatable and drinkable items, or vegetables and fruits to receive the highly nutritious food to keep us healthy. Choices can be made according to our preferences for growing plants in a garden. One of the types of garden is miniature which is also used for growing varieties of plants. Different containers can be used for cultivating the miniature garden to produce vegetables, fruits or herbs and can be used in kitchen in culinary. Miniature garden does not demand large space for the cultivation of tress and can be used to grow highly rich food. We can grow dwarf or miniature trees in preferred containers and can keep them at our roof or patio. There are varieties of dwarf of miniature trees available for small containers. It can be beans, peas, beets, cilantro, dill, sage, marigold, lily, pineapple, blueberry, lime, etc. 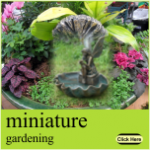 Miniature gardening is considered to be a cost effective method for cultivating a garden and benefit us in many ways. Seeds for growing organic plants are available at lesser price that helps in to save the money. Usage of compost like peel of vegetables and fruits, eggshells, grass, leaves, etc., is beneficial to grow the organic food. Usage of organic fertilizer or compost to grow food allow us to receive the highly nutritious food. It cures many diseases and protect us from many health issues. Cultivating kitchen garden means ripe food can be plucked any time and we need not waste time to purchase the same food from the market. The problem of storing the food will not occur and a food with good health can easily be used anytime for preparing varieties of food. Herbs can be added to the dishes as a ingredient to make it more delicious and healthy. There are many plants that bring down the temperature level, increase the oxygen, decrease carbon in our surrounding, and purifies the air quality for better breathing. Breathing in pure air helps to function our mind actively. Container consisting the colorful flowers and fruits attracts the butterflies, birds, bees. Fragrance of such flower motivates the pleasant feeling. And if these plants are kept on roof or terrace then we can spend more quality time around these flowers.